After the Charlie Hebdo massacre in Paris, the cyber terrorist organization, Anonymous declared war on ISIS and all other terrorist organizations. They have pledge to disrupt terrorist websites and social media accounts. I applaud their efforts. Remember, the Boston Marathon bombers were first radicalized online. Someone needs to stop the spread of that poison. 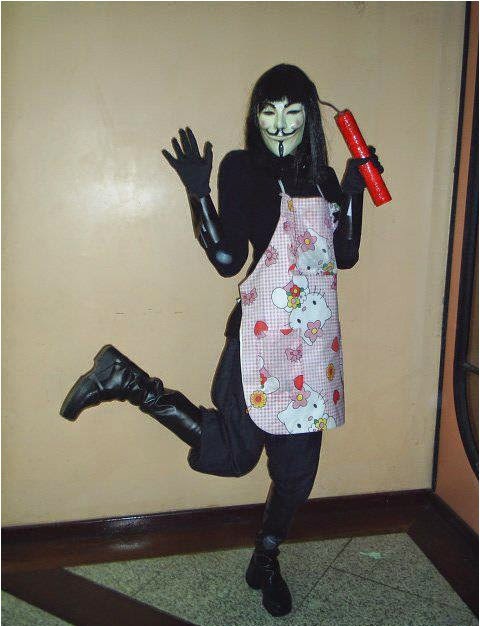 I applaud Anonymous for taking this on and I hope it consumes all their energy. Personally, I like Anonymous. I agree they are a terrorist organization who can cause genuine harm, but usually don't. Many people have commented how they only really cause inconvenience by shutting down websites for a little while before declaring victory and running off to the next idealistic movement of the moment. And there is nothing I can say to negate those realities. However, I love what they represent. Anonymous is the collective voice of the super-geek who believes in many of the same things I do. As such, they will always have a special place in my heart because they have the courage to fight back. They are also that thread of juvenile delinquency that I find so lacking in modern youth. In typical childish manner, they make boastful threats and grandiose claims. They make their political statements loud and clear then make some poor IT department miserable for a week to ten days. They accomplish little, but are heard by millions. Their targets and behavior prove that Anonymous overwhelmingly consists of angst-ridden teenagers. Good! Kids should be morons and jerks. They should be angry and they should fight. That is perfectly normal. I worry about the teenagers that aren't jerks. I'm convinced they're adolescent serial killer sociopaths, or something. But, these Anonymous kids are non-violent. No one has died because of Anonymous. More Americans may know about ISIS, but enough know about Anonymous, too. They achieved that notoriety without beheading anyone or actually destroying any real property. Taking down a website is a nuisance, nothing more. It has nowhere near the same life altering impact as watching your family murdered, your village burned then being taken into sexual slavery which basically describes a fun ISIS Saturday. So, while Anonymous is, by any definition, a terrorist organization, let's all agree that there are degrees of terrorism. Therefore, ISIS would be First Degree Terrorism because they are hurting real people and Anonymous would be Twentieth Degree Terrorism because they can really only inconvenience people. However, ever day that a jihadist website is down or terrorist Twitter account silenced, is another day without the spread of destructive, hateful ideas. I hope they shut down all those damn terrorists, saving themselves for last.